First, get hold of a computer Power Supply (PSU). A 250W PSU will suffice, but obviously 300W, 400W or 500W is more desirable, because you'll be able to charge bigger battery packs and more cells. The example used here is a 400W unit with the latest dual 12V output for the new-type motherboards that require a separate 12V supply for the CPU. We'll put the dual output to good use by connecting 2 sets of outputs so that 2 chargers can be connected at the same time. If you're going to use a second-hand PSU, make sure it's working 100%. It'll be no good if it was thrown out because it wasn't working properly in a PC. All you need to do to verify if it's usable, is to measure the voltages of 2 leads: Any of the Yellow leads should show 12V (or slightly above). The Red leads should measure 5V. (Black is ground/earth). A good indication of how much power a PSU can deliver is to look at the specs that's printed on the label. Usually there is a sticker on top or on the side of the case that states the Amp ratings. 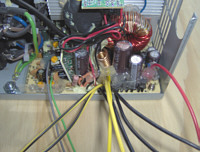 What you'll be interested in is the Amp rating for the +12V supply (Yellow wire). 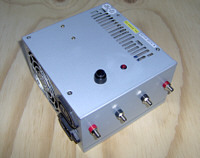 10A is typical for 250W PSU's, 13W for the 300W units and 15A for the 350W and 400W ones. 1 Gray wire (PG Signal) (This will only be present if the PSU is one of the newer designs with sensing wires). Probably the best way to insulate the stubs of cut wires, is to seal them with hot-melt-glue. Liberally cover them so that they can't cause any short-circuits. 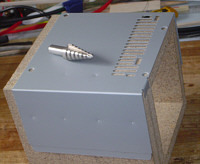 Mount the 2 banana plug sockets (1 Red and 1 Black) on the case of the PSU and for that you'll need to drill holes big enough for the plastic insulating parts to fit through. Normally, the back of the PSU is a good place to mount the banana plug sockets, as you don't want them on the same side as the fan and the mains lead. 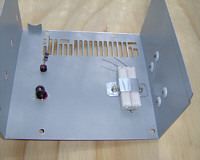 Ensure that there will be enough space inside the PSU case for the back ends of the sockets not to foul any of the PSU components and heat sinks. 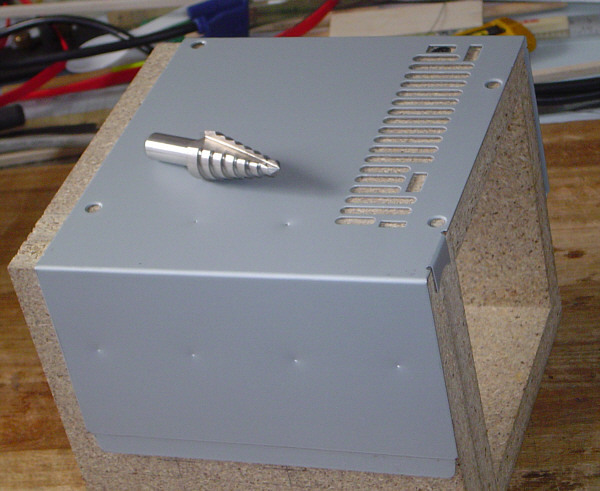 In this example, I had to mount the sockets on one of the sides of the case. Don't mount them too close to each other, otherwise your charger crocodile clips might touch! 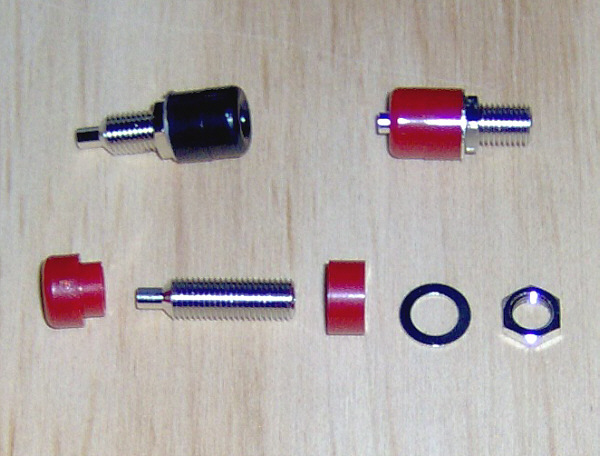 When mounting the banana plug sockets, dismantle them completely and reverse the order the parts screw onto the metal centre part, so that you can tighten the nut from outside the case. That way you'll have a length of metal thread sticking out the PSU case, onto which you'll clip your charger's crocodile clips when tapping power. See main picture. Connect 1 Yellow wire and 1 Yellow/Black wire to the Red Socket and 2 Black wires to the Black Socket. We're using 2 wires so that they can better carry the heavy currents while charging hard. 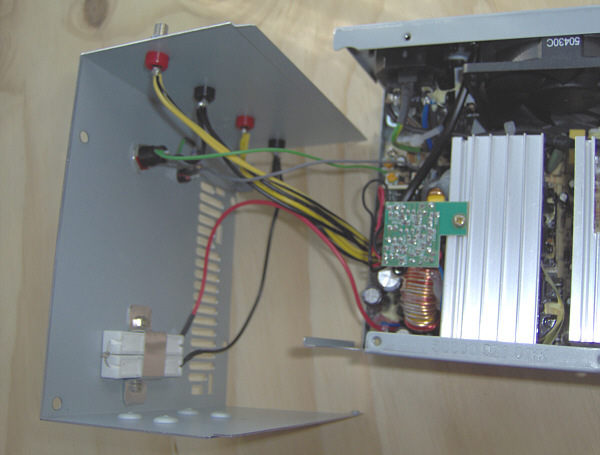 If you're only converting a 250W PSU, then 1 wire per socket will be sufficient. 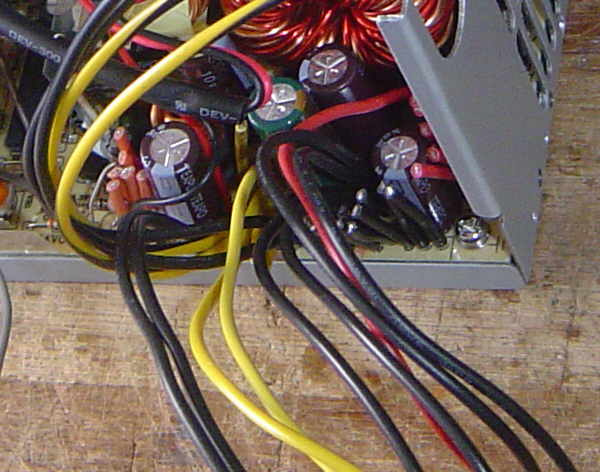 If your PSU has dual 12V outputs (Yellow/Black wires present), then you have the option of mounting an extra set of outputs, like I did in this example. Installing a load on the 5V line (Red wire) is the secret to a successful Power Supply that will be able to maintain a high enough voltage (12V or close to it) on the outputs so that your charger can work properly. Without this modification, the voltage will drop significantly while charging at high current. It's important to get the square sandbar-type resistors, so that they can be mounted flat, somewhere inside the case onto bare metal for proper cooling. Use some heat sink paste for better heat transfer. Round resistors won't work here and will get very hot if the heat cannot be transferred to a heat sink. 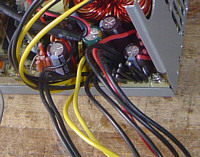 The 2 resistors should be connected in series and be connected to the 5V (Red) wire on the one side and earthed to a Black wire on the other side. (Refer to the picture). I used an aluminium strap with 2 screws to hold the resistors side-by-side, firmly on the inside of the metal case. A good idea is to mount it close to the fan where it will get even better cooling. In my prototype, the outside of the case in the area where the resistors were mounted, reached 35deg. Celsius, so any additional cooling you can provide will be beneficial. Mount the switch somewhere convenient on the case. It only needs to switch a few milliamps, so a small switch will be adequate. Solder the Green wire to one of the 2 terminals and a Black wire to the other. To really round off your new Charger Power Supply nicely, why not install an LED to indicate when the unit is switched on? After mounting an LED on the case (near the switch makes sense), connect one of the Red wires (+5V) to the anode (+) side of the LED. Then connect a 220 ohm resistor on the cathode (-) side, before grounding it to one of the Black wires. The cathode (-) is the shorter leg of the LED. Note: On newer model PSU's with sensing wires, the "Power OK", "Power Good" or "P.G. Signal" wire (usually Gray) may be used to connect the 5V+ to the anode of the LED. 1. Before connecting the completed Charger Power Supply to the mains supply for the first time, carefully check all connections. Remember you're working with potentially hazardous voltages. 2. Most PC PSU cases are earthed, i.o.w. the metal box is connected to the negative (-) lead of the supply. 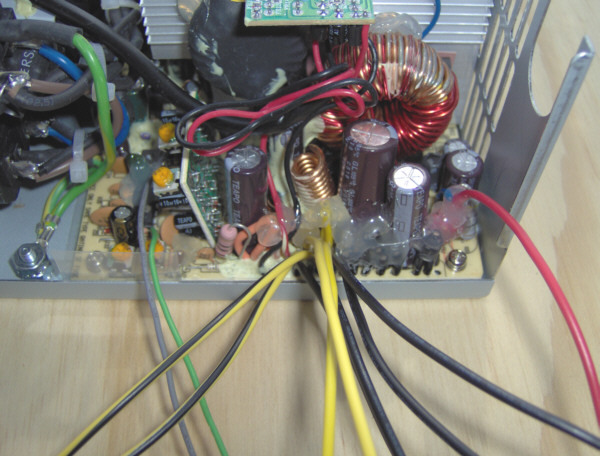 To prevent accidental short circuits when the charger lead to the battery touches the PSU case (speaking from experience), it's a good idea to paint the outside of the PSU case to insulate it. PSU cases are normally galvanised (conductive) and prolonged short circuits "will" damage your charger. 3. And of course, make sure the fan inside the PSU is working properly. You have to cool down the power supply sufficiently when charging.